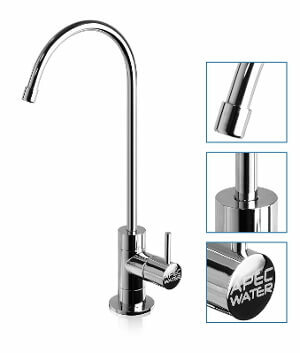 Read this review of the popular APEC Essence ROES-50, APEC Water's entry level under-sink water purification system. Customers rate it highly on several platforms. It can deliver enough clean drinking water for smaller households and reduces lead, arsenic, fluoride plus a lot of other unwanted water contaminants. Tank: 11" x 11" x 15"
How much do replacement filters cost? This high performance reverse osmosis filter has five stages. The 1st stage acts as a trap for sediment. The 5 micron filter catches rust, dust and other particles. Here a 10 micron filter removes chlorine, bad taste and odor, cloudiness and color. It also reduces VOC's and some other chemicals. The second 10 micron carbon filter stops s chlorine, bad taste and odor as well as other impurities that made it through the 2nd stage. This high rejection TFC RO membrane is able to remove arsenic, bacteria, lead, fluoride, chromium, radium and more under varying water conditions. Noticeable are the wider operation limits. The 5 micron GAC coconut shell filter removes bad taste and residue. The tank of this system can hold up to 4 gallons. A lead-free faucet comes with the system. Included in the package are quick connection fittings, a stainless steel check valve, a flow restrictor, food grade tubing and ½" input feed water adapters. They also through in some installation hardware like a wrench, tank ball valve, feed water valve, drain saddle and Teflon tape. Optional is an Ice-maker connection, you would have to pay extra for. This filtration system is made in the USA using top tier, ultra durable materials. All systems are rigorously tested before they leave the factory. Unlike some competitors, APEC Water does not use lower quality generic parts to assemble their systems. The filters need very little maintenance due to their high capacity. The whole system is tested, certified and was rewarded the WQA Gold Seal. That means it meets strict public health standards and passed weeks of testing for material and parts safety, structural integrity, and most importantly contaminant rejection. Click here to find out how the APEC Essence ROES-50 compares to other reverse osmosis water filter systems. 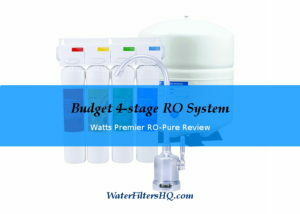 If you use this system with water from a public supplier you only have to replace the stage 1, 2, and 3 filters once a year. The membrane only needs to be replaced every 2-4 years for city water users. If your water comes from a well, replacement might be necessary earlier. For best performance you should change the stage 5 filter always together with the membrane. Overall these are pretty long filter change intervals. That will save a lot of time and money in the long run. APEC, Advanced Purification Engineering Corp., has more than 20 years experience with residential reverse osmosis systems. This California based company ships it's water filters worldwide. 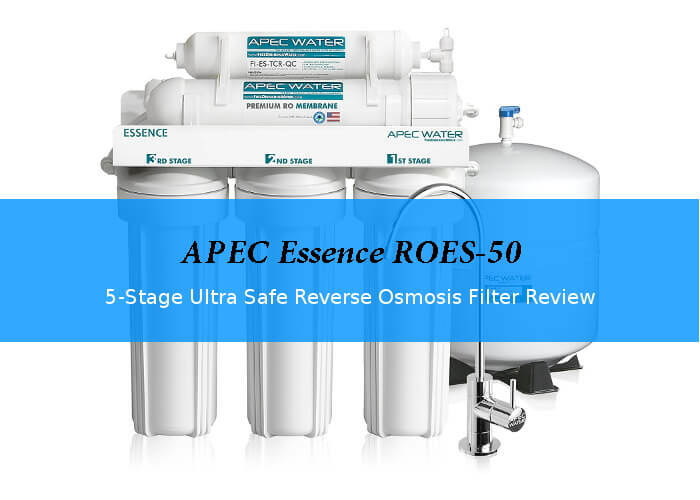 Although it is very unlikely that your new reverse osmosis drinking water filter system will fail, the APEC Essence ROES-50 reverse osmosis filter system comes with a 1-year limited warranty. In the unlikely case that you have trouble with your system, you can get help directly from manufacturer by phone, email or via chat. 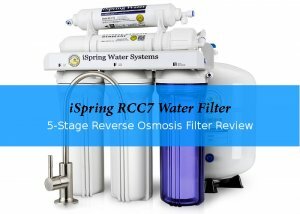 This 5-stage reverse osmosis system needs new filters regularly. The first three filters last six to twelve months and to replace them you pay around $27. The 5th stage filter lasts longer, 2-4 years. The cost for this filter is about $9.50. The membrane works for two to four year before you need to change it.This would set you back roughly $45. To run this water filter for the first two year, you would need to spend between $27 and $81 for new filters, depending on your water quality. The next two years would be a bit more expensive: $108 to replace the first two filters every 6 months plus a new membrane for $45 and a new post filter for $9.50. That adds up to $162.50. Only quality material is used. The intervals for filter change are long. The faucet that comes with the system is ok, but for a nicer one you have to pay extra. 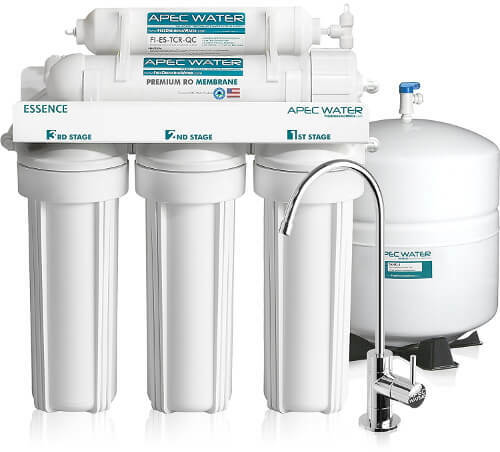 With all the options you have when choosing an RO filter, the APEC Essence ROES-50 water filter system is a powerful water filter that removes a wide range of of dangerous contaminants. Quality materials used in combination with excellent support are just some of the reasons you will not regret buying this under-the-sink reverse osmosis water filter.